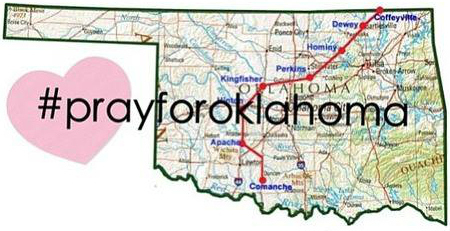 We had a post ready to go for today, but out of respect to our loyal followers from Oklahoma, and others who have been greatly affected by the devastation of the current conditions from the tornado, we've decided to postpone today's post and hope that you'll keep all of the families and friends who were victim to this horrible destruction in your thoughts and prayers today. Thank you! i live twenty miles north from Moore and it is so devastating to have friends and neighbors in such horrific conditions. i know they appreciate all prayers and it definitely helps knowing they have the support from people across the country. thanks a million. Thank you for posting this. I am a follower of yours and a Moore resident. Thankfully our family and home were spared. The devastation in our area is unbelievable. We are so grateful for your prayers. So glad you ladies and your families are safe and sound! I just can't imagine the heartache right now. You're all in our prayers! It is awesome of you to post this. I'm from OK & while we weren't directly affected, several friends lost everything. The last movie that we went to see was in the Warren Theatre that was hit. It has been very unbelievable. We live in Oklahoma and my son is a policeman that is helping in the search...it is devastating. Thank you for prayers. Thank you for posting this. I live in Moore and my inlaws have moved in with us since they lost their home. It sounds selfish, But I have felt sad skimming through some of the other blogs I follow and seeing them go about their regular lives. Of course, I understand.....that's exactly what I do when something happens across the country and there is nothing I can do. But it was so nice to read this post and see that someone was thinking about us. I am so thankful my family is safe, it could have been much worse. And yes, we all need to pray for the poor families that are suffering the loss of loved ones. It's so sad.